The idea of an EQC Qualifier was first brought up after the representatives of the General Assembly suggested we find a new way to decide which Belgian teams would go to the European Quidditch Cup. We needed to find a fair way that showed which teams performed the best over a longer period of time. BQF decided at the beginning of the 2017-2018 season to come up with a new events structure for the new season. 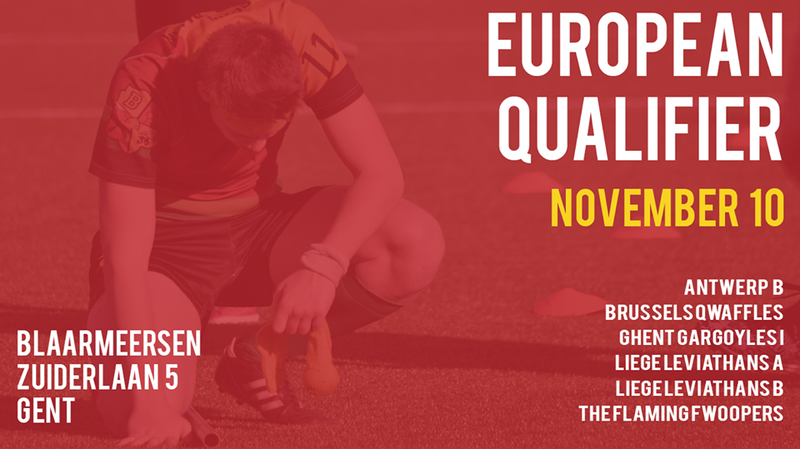 The Belgian Quidditch League 2017-2018 ranking would serve as a way to determine which teams could compete for these EQC spots and which teams would have to play the Development Cup to get a chance to participate in this tournament. For EQC 2019, the team that won the 2017-2018 league automatically qualified for EQC. Teams placed second to fifth would be invited to play the EQC Qualifier. The other Belgian teams would battle it out in the Development Cup for the last 2 invitations to the Qualifiers. In total, 6> 4* teams will compete in the first edition of this tournament. *The Flaming Fwoopers and Liege Leviathans B will not be participating for various reasons. It will be held end on November 10th, 2018 in Ghent. For the first edition of the European Qualifier, all teams will face each other once in a round robin. Then, a ranking will be made. The first and second ranked team will qualify for EQC and battle it out for the first place (and the seeded EQC spot). The third and fourth ranked teams will fight for the last available spot for EQC. SWIM = Snitch When It Matters = a difference in quaffle points of 30 or less at the moment of the snitch catch that ends the first game period. A game that goes into overtime is counted as a game in SWIM. If there are any issues, please send an email to gameplay@quidditchbelgium.be . Black Shaker Events, who sponsored our Belgian Gryffins at World Cup last summer, will be providing food and drinks during the day. Make sure to bring cash to pay for your food or drinks! For non-playing volunteers and officials who are scheduled: we will be providing lunch. If you have any food allergies, please contact us asap. This only counts for volunteers and officials who are scheduled! If you’re not scheduled, that means you are not eligible for the free food.